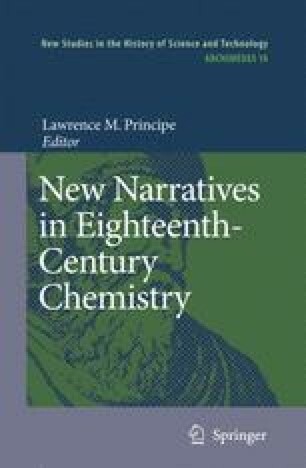 Through the eighteenth century chemistry became an autonomous science in many parts of Europe. In France, its promotion was indeed the result of the creation of a class for chemistry at the Paris Académie Royale des Sciences as early as 1699, whereas a class specifically for physics opened only much later in 1785. But the academic culture was only one facet of chemistry in the eighteenth century. Up to now most historians of chemistry have focused on the academic face of French chemistry. Consequently the emphasis has been put either on the famous episode of the Chemical Revolution conducted on the prestigious academic stage or, more recently, on the early eighteenth century when the Académie Royale des Sciences set up a program for the systematic investigation of plants. The period in-between remains a black hole. The mid-eighteenth century looks like a forgotten period for chemistry, falling in the shadow of the star production of the French Enlightenment – Diderot’s Encyclopédie. However, this alleged empty period was full of local events, such as chemistry courses. In an age when training and enlightening the public were not two separate activities, experimental demonstrations constructed chemistry as a fashionable and legitimate science. Not only did they craft many practitioners of chemistry but they were also compelling for philosophers such as Jean-Jacques Rousseau and Denis Diderot.